USD was weakened by the Yellen’s comments and EUR did not grew even though Germany PPI was align with expectations. 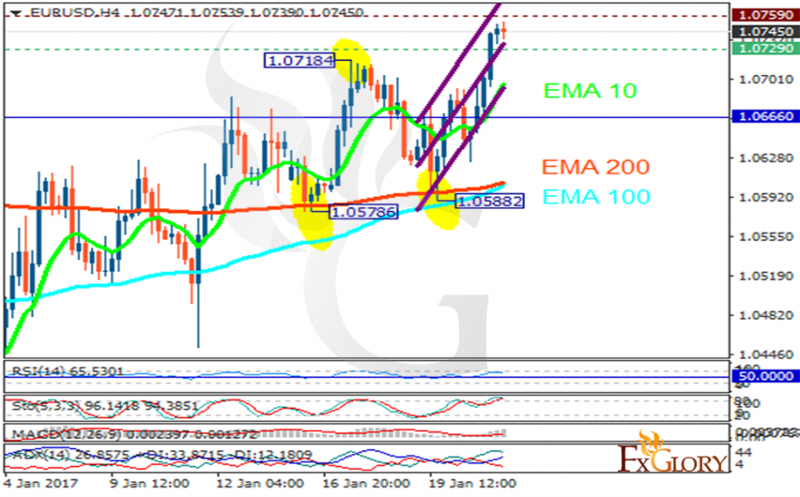 The support rests at 1.07290 with resistance at 1.07590 which both lines are above the weekly pivot point at 1.06660. The EMA of 10 is moving with bullish bias and it is above the EMA of 100 and the EMA of 200. The RSI is moving in overbought area, the Stochastic is moving in its maximum rate and the MACD indicator is in positive territory. The ADX is showing a buy signal. 1.072 level seems to be such a strong resistance zone to be broken today therefore pullbacks are happening targeting 1.0600 area.